Rubber Room Ramblings: I AM ADDICTED!! I believe it is official. I am addicted to my Owl Punch! I really love this thing so much, and it is just so versatile and fun that I can't seem to stop myself. On the Stampin' Up! Demonstrator website they have made this owl into just about everything you can imagine. The card below is one we'll be making tonight at my monthly Wright Club get together. As you can see, the owl has become a nurse! 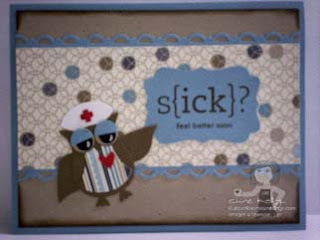 I'm sure that anybody who is feeling sick will get a big kick out of receiving this little card. What better way to put a smile on someone's face than a hand-made card that's this stinking cute? ?